So my Mustang Special has, electrically speaking, shat the bed. It has a pair of humbuckers with Mustang style three way switches above each one. 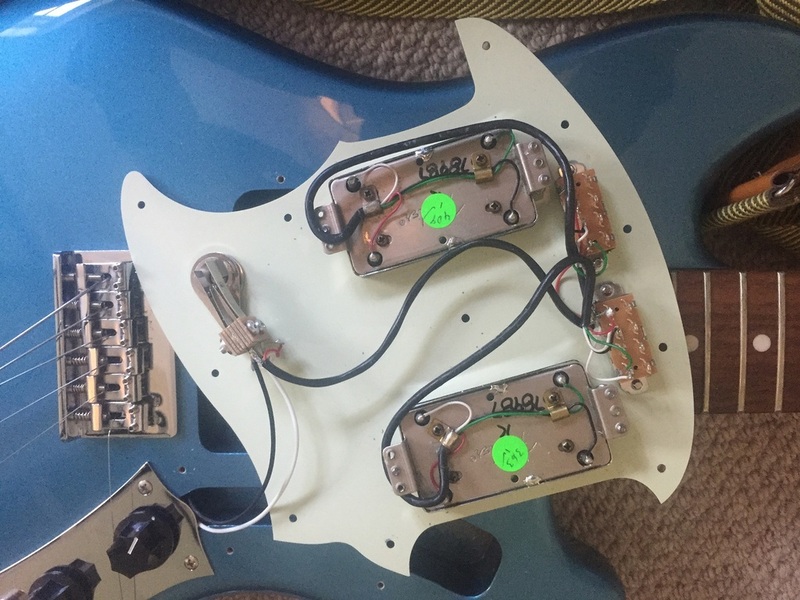 The switches are used to switch between humbucker mode (switch in central position) and single coil mode (switch towards the bridge for the bridge side coil and switch towards the neck for the neck side coil). The bridge pick up, however, now only works with the switch towards the bridge. When I switch to both coils or the neck side coil I get silence. I know close to nothing about these things but I've done a quick visual check and everything appears to be connected correctly and nothing seems to be touching against something it shouldn't. Any suggestions as to what I should look at / test / hit with a spanner etc? This shows both pickups / switches. The bridge pick up is the one at the bottom of the photograph. This is a close up of the bridge pick up. Here's the wiring diagram if it helps at all. How old is it? Take it back the shop? Bought it about three years ago (from GAK, which I live nowhere near now) so I don't think that's an option. If I can't work anything out DIY style though I'll have to find somewhere local that could fix it. Can't believe these have been out for three years, which is why I asked. Ah, I see. My description was probably a bit vague. I think they came out in 2011. Chances are your pickup is somehow busted. One of the coils may have developed a short, but that seems so unlikely. Do you have a multimeter? It would be quite easy to test between the four terminals that are easily accessible at the bottom. Also, now that your pickguard is outside the guitar, plug the guitar in and see if it still is busted, using a screwdriver to just gently tap on the pickup, because thanks to the terminals being exposed to the outside world, there's a chance that a foreign object inside the guitar caused the terminal to touch the ground. If that is the case, just put the pickguard back (maybe lightly cover the four terminals in electrical tape) in and it'll probably be fine. But if it's your pickup that's busted, well, then, you're really out of luck. Nothing you can do other than either try to repair it yourself or send it to a rewinder. On a covered pickup like this, it's probably a bit beyond what you're comfortable with. The other possibility is that the pickup lead from the pickup to the switch is busted. That would be far easier of a fix. That's why you need to test the pickup with a multimeter. Thanks for your suggestions Honeyiscool. I don't have a multimeter but have just ordered one so will be able to do some tests at the weekend. I tried testing it with a screwdriver, plugged in to an amp, whilst I had the pickguard off and got the same results (i.e. I got a sound when the bridge side coil was selected but nothing when I selected either the humbucker or neck side coil). I had wondered if just pulling everything apart and reassembling might cure it, like you say because something was touching something it shouldn't, but unfortunately no joy this time. The only time you get sound is when the switch is set so that it shorts out the green-to-white coil. If the wiring and solder joints are OK that implies to me that the coil is open circuit. Thanks Nick. I had no idea what "open circuit" means but, with a little help from teh interwebz, I discovered that it's "An electric circuit through which current cannot flow because the path is broken or interrupted by an opening". So, would that possibly mean that something has become disconnected inside the pickup? Possibly either the neck side coil or the connection between the two coils? If that's the case then I fear fixing it might be beyond my meagre skills . Would the multimeter confirm this? I take it you've tried wiggling the switch to see if it's died? Mustang switches are the worst, luckily they usually work fine after a cleaning. Yeah, my initial thoughts before I opened it up was that it was either going to be a loose wire or a dodgy switch. I've cleaned the switch with some contact cleaner and given it a thorough wiggling but with no joy. Hopefully the multimeter will help me narrow it down. If the pickup turns out to be fine, then I might need to replace the switch. The soldering doesn't look that great either: that big blob could be cold soldered, and there might not enough solder in other places. Also you could be putting pressure on the pickup leads if you're not careful when you put the whole thing back in. It's an easy fix, but if you don't know how to use a simple resistance meter to check continuity it won't be of any use. The soldering doesn't look that great either: that big blob could be cold soldered, and there might not enough solder in other places. Do you mean on the bottom left of the switch where the red wire is connected? The red/black side of the pickup is the coil that works (although not sure I really understand which way the current runs when the switch is in each of the three positions so I could be totally missing something here). Also you could be putting pressure on the pickup leads if you're not careful when you put the whole thing back in. Yeah, I was very careful putting the pickguard back on so as not to make things any worse. Everything works the same as it did before I took it off so hopefully haven't damaged anything. I'm guessing that using the multimeter itself won't be too difficult (sure I did it many moons ago at school) but what I don't know is where to check between and what that tells me. Any advice about that would be very welcome! I'd be happy to take a look but the closest I get to London is Bracknell. There's no point in changing the switch as with that wiring scheme the switch doesn't do anything in the middle (humbucker) position, yet you have no output. 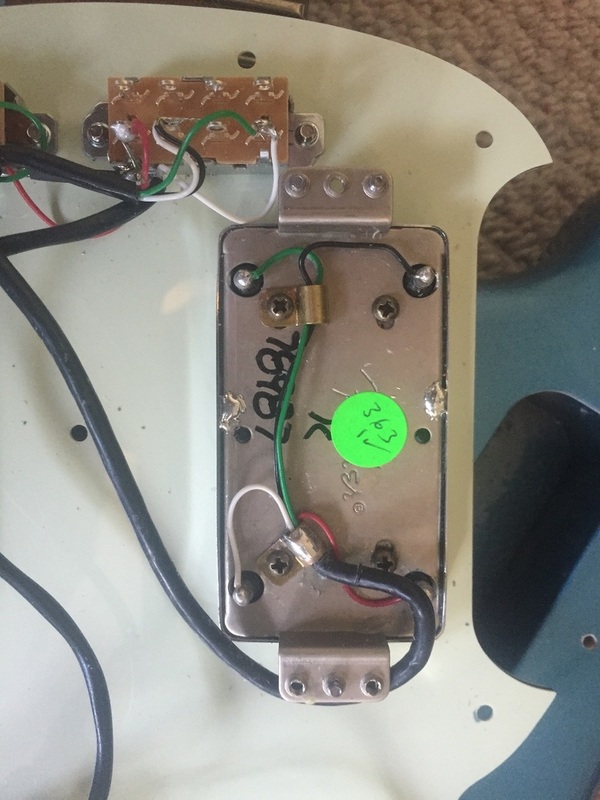 In the neck position it shorts out the red-black coil leaving the green-white coil across the wires that go to the pickup selector switch and there is no output. Both these can only be explained by a failure in the green-white coil circuitry. With the switch in the middle position, check the resistance between the pickup pins that the green and white wires are connected to and compare it with the red/black pair. I don't know what the normal reading is but if it's much higher then you have a break in the wiring or bad solder joint inside the pickup. If it looks OK, check again at the switch. A "cold soldered" joint means that the solder hasn't properly wetted the surfaces of both the objects to be soldered, usually because one wasn't up to temperature. This can allow air to get in, causing oxidation of the surface and oxides are generally bad conductors (copper oxide can be used as a rectifier, but not at the sort of low voltages normally generated by pickups). 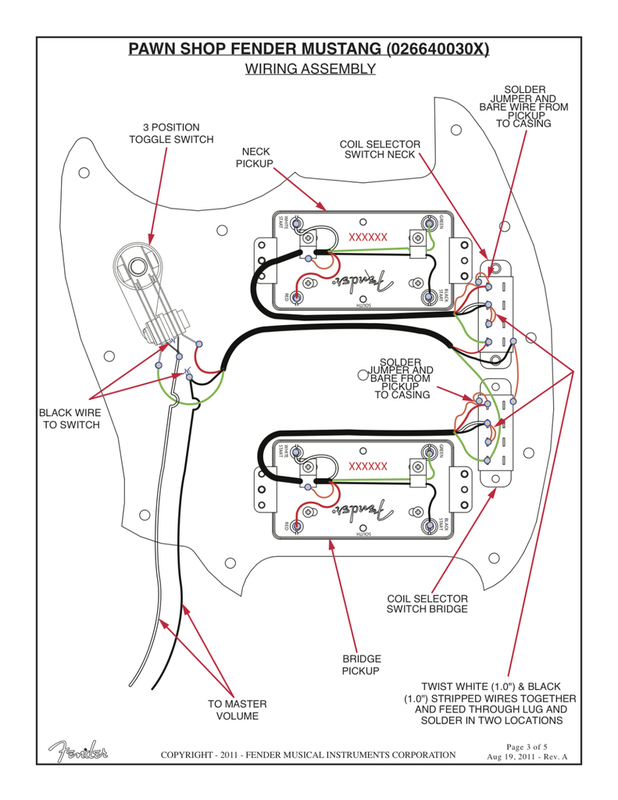 I had that problem with my 2008 USA Strat bridge pickup and they fixed it under warranty 15 months after purchase. Thanks Nick. I'm actually in Nottinghamshire these days so even further away Must update profile at some point. I'll do the tests you suggested when the multimeter turns up. My game-programming son lives in Long Eaton, we see each other every few weeks. we're getting old. anything up to about 5 years ago seems like last week. Wow. I'm just the other side of Nottingham (place called Southwell). Small world. Grew up in Bracknell too (just to make it smaller still). Is he the one in the band? Or is that a different son? Ha, yeah. I had to dig out the receipt e-mail when Bacchus asked how old it was. Was staggered when I realised I had had it for three years. In my head it was a recent acquisition.